Discussion in 'UFC Discussion' started by savemgs, Aug 24, 2015.
why do people act like Chris Weidman would be a undersized light heavyweight? when I thought I started watching mma in the nineties Weidman would have been able to compete as a heavyweight with almost no problem at all in the size department. I was listening to want to Joe Rogan's podcast and he said him and Jon Jones should fight at a catchwright. Because most of the posters here are tiny and live vicariously through bantamweight fighters. Just look at Lucipher Alfa, how many tens of thousands of his posts are defending small men? Just look at all the bantamweight white knights. Wishing they were 6 footers instead of malnourished srilanken male sized. The Chris fighting at 205 would be fun, Weidman vs Rumble for the win. On no planet with any lighting from any angle will Weidman be anything besides smaller than Tito. Then to say Weidman even "makes him look small" just warrants no response. By the way, in case anyone is interested Chris said he walks at 210 pre-camp these days. Would plan to bulk up to 225 walking if he ever moved to LHW, per MMA hour. Having stood next to both of them, The Chris is about the same size as Shogun, a fighter people have been saying should be a middleweight for years. I didn't know people were making this claim in the first place. Oh well, yeah he could easily fight in 205 within a year. He wouldn't be small at all. He could probably fight there but he probably wouldn't be as good, and there are bigger fighters, legit HW like DC, waiting for him. If he gains 15-20 lbs of muscle, Weidman will be about the same size as Bader who is not a small LHW. He has the height already and the frame to fill out with addional size. Once he does that he be a formidable LHW based on physique. With some nice wins a lower weight class to carry along with him. What are u even talking about? 6 foot isn't even that tall. I would argue that it is a greater leap to think that anyone can jump up a weight class and automatically assume they will enjoy the same success. There is good reason fighters don't change weight classes often, it is a drastic change in their whole lifestyle and can frequently have unforeseen consequences. I was guessing a minimum of MW. I think most people realize he'd be fine at LHW. He's got a long frame and he's 6'2. Never heard anyone say he'd be undersized. I don't understand most of what you wrote. Autocorrect issues or something so I'll just say he would be an undersized LHW. I don't care what things look like to you. Your observations are poor. He would be a smaller LHW, these guys like Gus, Glover, and a few other are big boys. BTW, Tito is bigger then Chris no question. 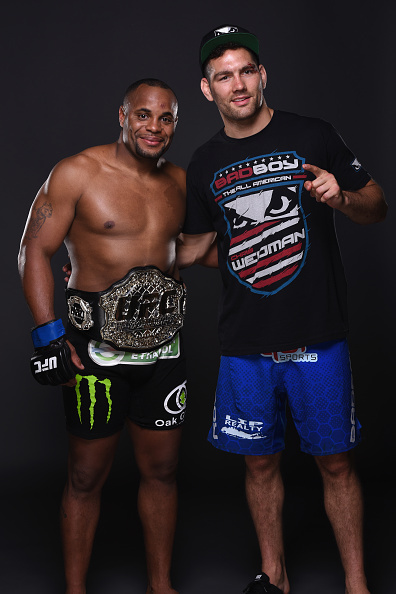 Pretty much, Weidman seems about the same size as a lot of guys who fought at LHW in the past/present but could likely make MW. The division has clearly changed in the last few years though with fewer of these fighters and more potential HW's like Jones, Gus, Bader, Davis, Cormier, Glover and Rumble(might have cut to WW in the past but looked nothing like he does today). Indeed I think the change in size at LHW is so significant that really when your talking about a lot of older names you should really talk about them relative to todays MW's. cuz Vitor rocked him and nearly KO'd him with 1 punch. Imagine what a light heavyweight punch would do to him.